Komatsu has released its latest wheel loader, the WA600-8. The machine, equipped with an EPA Tier 4 Final certified engine combines a lockup torque convertor function and SmartLoader logic to aid fuel consumption and provide high travel speeds. It consumes 13 per less fuel than the previous model, while the standard bucket capacity has increased to seven cubic metres and reportedly retains material better. “With significant enhancements in production capacity and fuel economy, the WA600-8 is designed to maximise production efficiency in loading off-highway trucks or load-and carry applications, ” Rob McMahon, product manager for Komatsu America, said. “Full rear fenders with steps and handrails at both sides of the machine add convenience for daily inspections. And operators will appreciate enhancements in cab comfort and machine stability, ” McMahon said. The wheel loader is driven by a 23.15 litre, 529 HP, EPA Tier 4 Final certified, SAA6D170E-7 engine, and features a Komatsu Diesel Particulate Filter (KDPF) and other after treatment components are designed in conjunction with the engine for efficiency and long life. According to Komatsu more than 98 per cent of KDPF regeneration is performed passively, with no action required of the operator and no interference with machine operation. Additionally, Komatsu’s SmartLoader Logic, combined with the enhanced lockup torque converter that activates in 2nd, 3rd and 4th gear, provides optimal engine torque for improved acceleration, hill-climbing ability, a higher top speed and fuel savings. Inside the cab the wheel loader has a new, air-suspension, high-back, heated seat softens machine vibrations for operator comfort and cast frame members increase strength, seat-mounted electronic pilot control levers with F-N-R switch add operator ergonomic comfort and convenience. 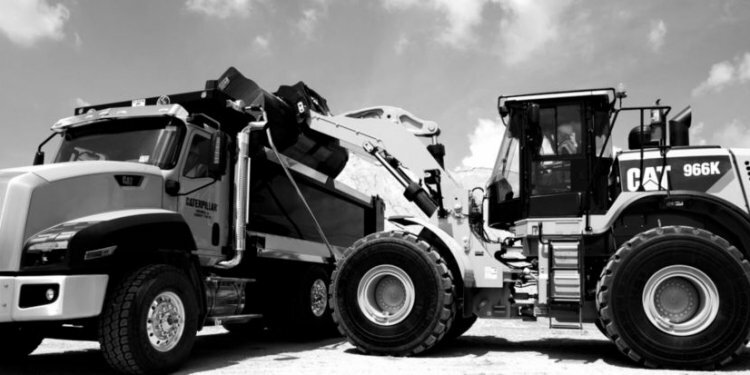 The machine also has a KOMTRAX Plus telematics system and monitor which provides key machine metrics, including KDPF status and DEF-level data, fuel consumption, plus performance information collected and sorted by operator ID. Komatsu have designed the plant with a Variable Traction Control system and Modulated Clutch system provide optimal tractive effort for various ground conditions; full rear fenders with stairs and handrails are now standard for both sides of the machine; a swing-out cooling fan with wider fin spacing and reversing fan eases cleaning; additional hinged panels at each side of machine eases access to regeneration components; a new enhanced auto-dig function reduces operator effort required to fill the bucket; whilst a Komatsu integrated load meter data is available on the machine monitor and remotely via the web. “The WA600-8 and every other Komatsu Tier 4 Final construction-sized machine, whether rented, leased or purchased, is covered by the Komatsu CARE program for the first three years or 2, 000 hours, whichever comes first. Komatsu CARE includes limited scheduled factory maintenance, a 50-point inspection at each service, and one complimentary Komatsu Diesel Particulate Filter exchange in the first five years, ” McMahon said.